Rapid analysis is crucial to modern process control. The ability to make even small changes quickly can add thousands of dollars to the bottom line over the course of a year. NMR technology is ideal for accurately determining fat and moisture in a wide variety of low-moisture products, including dairy powders, snack foods, pet foods, and other dried products. Unlike NIR, which only measures the surface of the sample, NMR directly measures fat and moisture throughout the sample, yielding an accurate analysis that is not dependent on sample uniformity and not affected by changes in color and texture. However, 1st generation NMR systems required temperature conditioning times of up to 20 minutes before the actual analysis, making more rapid, but less accurate techniques, like NIR, more desirable for fast-paced process control environments. FAST Trac combines NMR accuracy with NIR speed. CEM’s patent-pending NMR technique with rapid sample pre-conditioning accurately measures fat and moisture in only 2 minutes, including temperature conditioning time. Only 3 samples are needed to create new methods, as the calibrations are based on simple linear regressions, not chemometrics. FAST Trac methods are robust and maintenance calibrations, as needed by NIR systems, are not necessary. Intuitive software makes it easy-to-use...no PhD needed. FAST Trac offers the perfect combination of speed and accuracy for fat and moisture analysis in low-moisture samples. Even though NMR is a very fast analysis technique that only takes seconds, traditional NMR systems require a 20-minute temperature conditioning sample preparation step which has prevented the technique’s use in rapid QC processes. For this reason, CEM developed QuikPrep™, an integrated, patent-pending sample preparation technology. In only 30 - 60 seconds, QuikPrep conditions the sample before it is automatically lowered into the FAST Trac's NMR for rapid analysis. It has been difficult for traditional NMR systems, which use the well-known Hahn-Echo pulse sequence, to measure bound moisture in dry products with even a small percentage of fat because the partial relaxation of fat can lead to interference. Thus, traditional NMR systems can be unreliable for moisture determination if there is even a slight fat variation in the analyzed samples. CEM has developed a novel, patent-pending Interference-Free Moisture Technology™ (IFM) to overcome this limitation and accurately determine moisture over a wide variation in fat. IFM ensures rapid, accurate moisture measurement over a broad range of dry product samples. What Is NMR and How Does It Work? Nuclear* Magnetic Resonance (NMR) is the same technique as Magnetic Resonance Imaging (MRI), which has been widely used in the medical profession for years to accurately image the human body. In addition, many industries quantify oils, fats and/or moisture with NMR. Essentially, the NMR consists of a magnet and an electromagnetic coil. 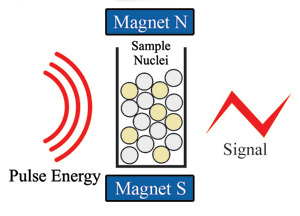 When a sample is placed within the magnetic field, the hydrogen atoms of the sample are forced to align with the field. The NMR then sends a pulse of radio-frequency energy through the electromagnetic coil and to the sample. This pulse creates a stronger magnetic field, which forces the hydrogen atoms to realign temporarily with the electromagnetic coil. When the pulse ends, the atoms “relax,” or return to their original rotational axis within the magnetic field. As they relax, the atoms release a weak electrical charge, known as Free Induction Decay (FID). The hydrogen atoms in fat and bound moisture relax at unique rates in the NMR that are much slower than the relaxation rates of protein and carbohydrates. Thus, both the amount of fat and bound moisture in a sample can be determined using the rate at which the atoms relax.